Dixon Technologies India Ltd IPO...... Should you invest? It’s another IPO on the line and we are all wondering what to do. 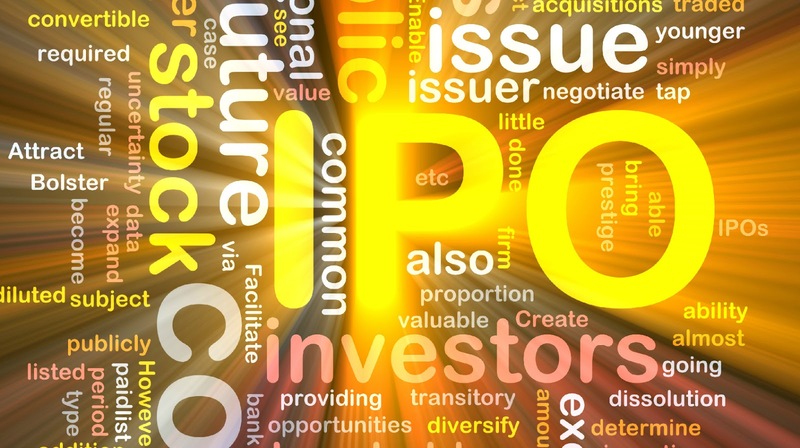 With two IPOs coming out at the same time, many are not gonna be able to invest in both. The IPO we are talking about today is Dixon Technologies Ltd. Quite a fancy name wouldn’t you agree. The issue opens on 6th Sep 2017 and closes on 8th Sep 2017. The total issue size is of Rs 600 Crs being offered at a price band of Rs 1760 to 1766. Minimum number of shares to be applied is 8 per lot. Now that’s done. Lets look at the interiors. 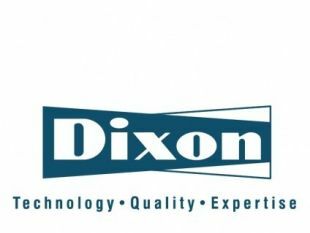 Dixon Technologies Ltd is a technology company that manufactures consumer electronics such as LED TV panels, Mobile phones, CFL lights and LED bulbs, washing machines etc. Now you would be wondering why you haven’t heard that brand name in these products. That’s because they don’t sell under their own brands. They actually manufacture for their customers which are Philips, Surya Roshni, Gionee, Panosonic India, Intex Technologies etc. Dixon Technologies is like Foxconn which manufactures for other well known brands. The promoter of the company is Mr Sunil Vachani holding around 43.97% in the company. The issue is partly a fresh issue and partly an Offer for Sale by the promoters. Of the total issue of Rs 600 Crs, Rs 540 Crs shall be an Offer for Sale and the remaining Rs 60 Crs will be utilised by the company. Looking into the objects it seems that the company is serious in expanding its business and to repay its debts. However not sure how much of all this will be possible with just Rs 60 Crs. Another thing to be noted is that, not sure how much shares of the promoter is gonna get offloaded in this issue. Looking at the promoter holding in isolation the promoter holding is quite less. 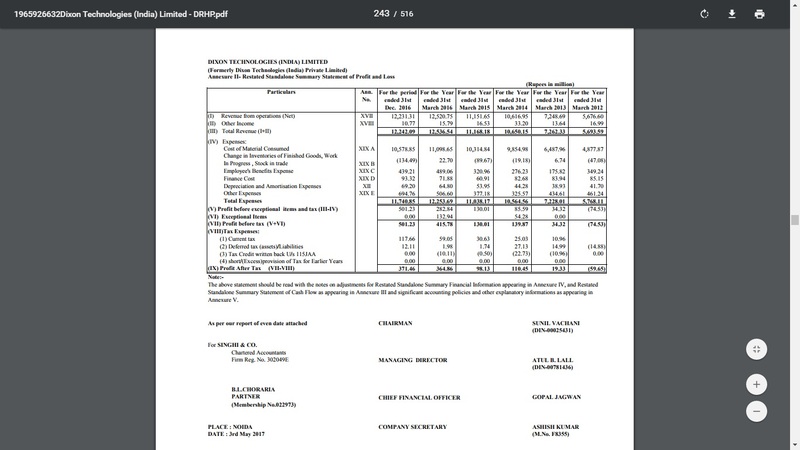 Further the total no of shares off on offer for sale is 37,53,739 and the rest of the fresh issue should be around 3,39,751 shares, making it a total of 40,93,490. Not sure about the odds on allotment here. 1) The company has seen a steady growth in networth from Rs 60.15 Crs as on 31.03.2012 to Rs 184.63 Crs as on 31.12.2016. Which shows a pretty good growth story. 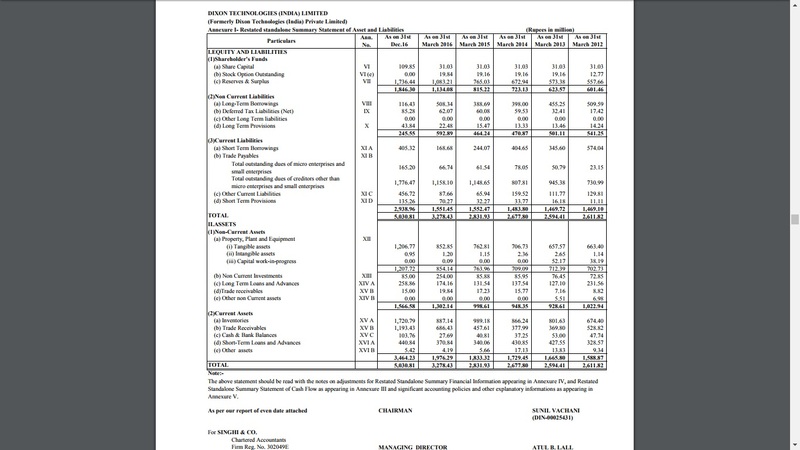 2) The company’s non current liability stands at Rs 24.56 Crs as on 31.12.2016 but including the short term borrowings of Rs 40.53 Crs it comes to Rs 65.09 Crs which is good when compared to the networth of Rs 184.63 Crs. However since short term borrowings are part of any normal business we can say the company is doing much better. 3) Company has decent amount applied in Fixed Assets at Rs 120.72 Crs as on 31.12.2016, however there is hardly any intangible assets. It would be really good if the company was able to develop some new technology thereby being able to earn on royalties as well. 4) One thing that really catches my eye is that the company has a huge amount locked in its working capital. Rs 172.08 Crs of inventory and Rs 119.34 Crs of Debtors yet to be realised as on 31.12.2016. This may be a normal trait for such companies as the company’s current payables are also high at Rs 239.84 Crs. 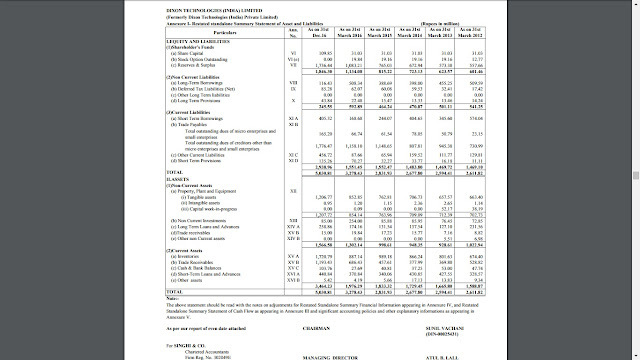 5) Now looking into the Profit and Loss A/c, we see that the company has had good growth in its revenues from Rs 567.66 Crs in FY 2011-12 to Rs 1252.08 Crs in FY 2015-16 and on to Rs 1223.13 Crs in 9 monthly of FY 2016-17 alone. That’s pretty good. 6) Total profit for the company in FY 2015-16 was Rs 36.49 Crs which is hardly 3% of turnover. Looking at the company it seems to be struggling. Their struggle with working capital is clearly visible here. However looking at any other Indian company that makes TVs or any other electrical products we must say that it’s a miracle the company is making profits because when it comes to electronics, we all know that, India is not up to take on China yet. But still Dixon Technologies is not only making profits but is also expanding and the profits are growing. 7) Another thing to look at is the ROE, which is 32.18% in 2015-16. Very much a appreciateable figure. The company’s EPS for FY 2015-16 was Rs 38.90 basic and 34.85 at diluted. For our calculations we shall take the basic which means that at Rs 1766 the PE of the company shall be around 45 times. Taking numbers of the 9 months of FY 2016-17 the EPS is Rs 36.80. Annualising this EPS the total EPS could be around Rs 49.07 and thereby making the PE come down to 36 times. Looking at the fact that the company is making profits and that the company is expanding, the valuations seems to be just on the borderline. I would say it’s rightly priced since all the money is not going into the company. So after looking into the financials and the valuations we would say that Dixon Technologies India Ltd is a “subscribe”. One of the reason is also that the free float no of shares are less which is gonna increase the demand for the shares.